San Fran Nan Pelosi Loves Crumbs If They’re Obama Crumbs | What Did You Say? Nancy Pelosi can chalk up another sound bite to the Really Stupid Comments Hall of Fame. 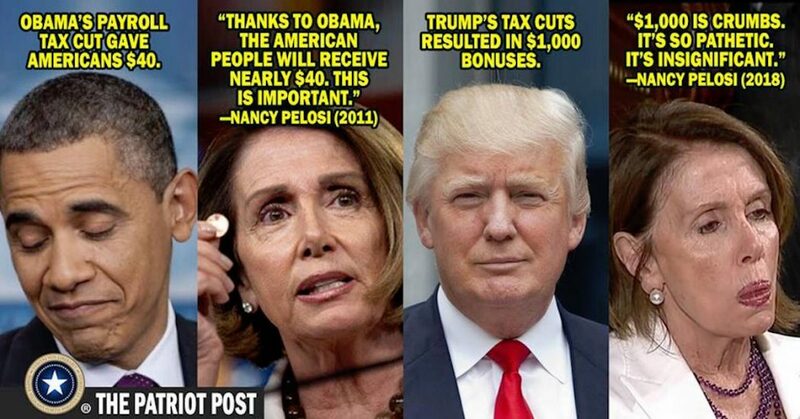 Pelosi waxed ignorant in response to the $1,000 bonuses paid out to American workers post Trump tax cut. In terms of the bonus that corporate America received, versus the crumbs that they are giving to workers to kind of put the schmooze on, is so pathetic. It’s so pathetic. Rep. Pelosi herself is worth between $29 million (per wikipedia) and $193 million (per Investment Watch), with The Atlantic citing a cool $74 million. I guess if I had $74 million I would consider $1,000 crumbs. But to us normals, Nan, $1,000 is almost a month’s rent/mortgage. That would pay my electricity bill for the year. I’ve got news for you Your Royal Frozen-Faceness, $1,000 is a very big deal. Today is a victory for all Americans – for the security of our middle class, for the health of our seniors, and for economic growth and job creation. The American people spoke out clearly and, thanks to President Obama’s leadership, 160 million Americans will continue to receive their payroll tax cut – nearly $40 per paycheck in the pockets of the average family. I salute the work of the unified House Democratic caucus on behalf of the American people. Let’s consider that. $40 per paycheck, on average, multiplied by 26 paychecks, is $1,040. So a savings of $1,040 for an entire year is cause for celebration when Obama is king…uh..president. But $1,000 bonuses PLUS increases in paychecks over the course of the year, is crumbs under President Trump. I see how you roll. Nancy Pelosi may be one of the most liberal members of the U.S. House, where she runs the Democratic caucus, railing against income inequality and the avarice of the 1 percent. But she also happens to be one of the body’s wealthiest members: In Washington, she lives in a multimillion-dollar Georgetown condo; she owns a 16-acre vineyard in Napa Valley and a 3,700 square-foot house in San Francisco’s tony Pacific Heights, according to her May 2015 financial disclosure statements. Her May 2015 financial-disclosure statements, showing income that places her in the top one-tenth of the 1 percent of Americans, may surprise some in light of the concern she’s expressed about income equality and the distribution of wealth. So every time Representative Pelosi bad mouths Trump and anyone else successful, think pot and kettle. Also remember, the modus operandi of The Left: nurture and feed a mentality of envy, thereby causing division and a deep desire to see whomever Progressives paint as “greedy fat cats” stripped of their lawfully acquired wealth, which should then be redistributed at the government’s whim. That’s the battle cry of Pelosi and Bernie and good old Fauxcahontas. They yell “SQUIRREL!! !” (or wealthy) and paint every conservative policy as a money-grubbing, greedy ploy. Well sorry, Nan. You can’t fool us normals, us deplorables. $1,000 plus larger paychecks is something to be thankful for. Could you just please go back to your vineyard and prep for your next Botox appointment? Drink some wine? Let the grownups who understand solid economics carry on the serious work as public servants.